The EPOCH 600 is mid-level, handheld ultrasonic flaw detector. Weighing only 1.68 kg (3.72 lb. ), its horizontal case is built to withstand the rigors of very harsh environments. EN12668-1 plus features such as 400 V PerfectSquare tunable square wave pulser, digital filtering for enhanced signal-to-noise ratio. 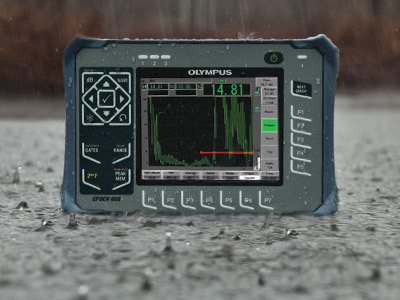 The EPOCH 600 Digital Ultrasonic Flaw Detector combines Olympus' industry leading conventional flaw detection capabilities with the efficiency of a highly portable, intuitive instrument. The EPOCH 600 flaw detector's blend of efficient menus and direct access keys allows you to take advantage of the highest quality flaw detection platform with exceptional ease of use. The large, full VGA transflective display combined with our patent-pending digital high dynamic range receiver provides a stable, striking A-scan representation in any lighting condition. Available in two hardware configurations, the EPOCH 600 offers you the choice to adjust parameters with a knob or with a navigation area on the keypad. The EPOCH 600 is designed to meet the requirements of EN12668-1 and allows a full range of standard and optional flaw detection features. The rugged, ergonomic design allows use in nearly any inspection environment, while the flexible PerfectSquare™ pulser and digital filtering capabilities can tackle nearly any application. The EPOCH 600 combines the efficiency of a basic flaw detector with the quality of Olympus' most powerful fully digital ultrasonic instruments. A full range of dynamic, reliable inspection features are packaged with economy of size and ease of use. This optimal balance brings powerful flaw detection features within reach of any level of inspector. The EPOCH 600 design is focused on providing a very high level of flaw detection with the simplicity of a basic instrument. The EPOCH 600 is designed to be ergonomic, intuitive, and practical for both experienced and novice ultrasonic inspectors. The EPOCH 600 user interface is based on the industry approved EPOCH 1000 Series imaging flaw detector. The EPOCH 600 combines a simple menu structure for instrument settings, calibration and software feature adjustment, with the EPOCH brand's hallmark direct-access key approach for critical inspection functions such as gain and gate adjustment, screen freeze, and file save. Supported in multiple languages, the EPOCH 600 user interface is intuitive for any level of operator. The EPOCH 600 is designed for use in nearly any inspection environment, from bench top testing in a laboratory to extreme outdoor and hazardous conditions. 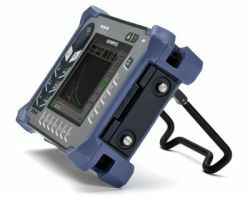 Designed for IP rating in either knob (IP66) or navigation pad (IP67) configurations, and tested to very high environmental and reliability standards, the EPOCH 600 allows users in any inspection environment to feel confident in both the performance and durability of the instrument. The instrument is tested for vibration, shock, explosive atmosphere, and wide temperature ranges. And with a battery life to exceed 12 hours, the EPOCH 600 is the perfect solution for remote inspection locations. The EPOCH 600 features a full VGA (640 x 480 pixels) resolution display. The horizontal design of the EPOCH 600 optimizes the A-scan size and readability on this high quality display. Built with transflective technology, this VGA display provides excellent clarity in indoor, low lighting conditions using its powerful backlight, as well as in direct sunlight by using the ambient light as a pseudo-backlight. The EPOCH 600 provides excellent quality ultrasonic performance. Based on the same digital architecture as the EPOCH XT, LTC and EPOCH 1000 Series, the EPOCH 600 provides flexible, powerful pulsing and receiving features to accommodate the needs of most flaw detection inspections. In order to accommodate different user needs and preferences, the EPOCH 600 is available in two hardware configurations: one with an adjustment knob and the other with a navigation area on the keypad. The adjustment knob and the arrow keys on the navigation pad are responsible for parameter adjustment and value slewing. 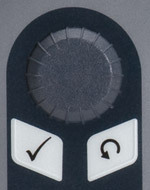 The adjustment knob on the EPOCH 600 is used along with the CHECK and ESC keys to adjust parameter values in either coarse or fine increments. You have the ability to lock the knob to prevent accidental parameter value changes during an inspection. This configuration provides smooth value slewing for customers who prefer adjusting parameters using a knob. The knob configuration is designed to meet the requirements of IP66. The EPOCH 600 navigation pad is a hallmark feature of the EPOCH flaw detectors. The up and down arrows on the navigation pad are used for coarse parameter adjustment, and the left and right arrows for fine adjustment. The navigation pad also contains additional functions and frequently used parameters such as gain, save, and the CHECK and ESC keys. The navigation pad configuration is designed to meet the requirements of IP67. IP rating IP rating Designed to meet the standards of the Ingress Protection (IP) rating number IP67 (navigation pad version) or IP66 (knob version) per IEC 60529-2004 (Degrees of Protection provided by enclosures - IP Code). 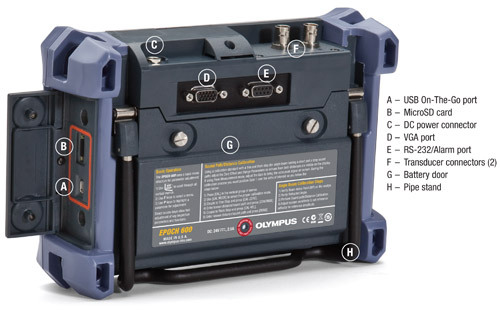 The product design was confirmed to meet the IP rating by means of Olympus NDT's internal design verification test process that occurs prior to the release of the product to production. Explosive atmosphere Safe operation as defined by Class I, Division 2, Group D, as defined in the National Fire Protection Association Code (NFPA 70), Article 500, and tested using MIL-STD-810F, Method 511.4, Procedure I. Shock tested MIL-STD-810F, Method 516.5 Procedure I, 6 cycles each axis, 15 g, 11 ms half sine.